Brewes Corner, as Reg Fulleloive would remember it. Image from ‘Memories of Brownhills Past’ by Clarice Mayo and Geof Harrington. There was a terrific response last week to my featuring the first instalment of Reg ‘Aer Reg’ Fullelove’s life story here on the blog, with Reg’s warm and intimate writing stirring many fond memories of Brownhills. This week, it’s my pleasure to publish the second instalment of this remarkable story, where Reg remembers community entertainments and activities of his childhood. If you missed the first instalment, you can read it here, and there will be another episode next week. 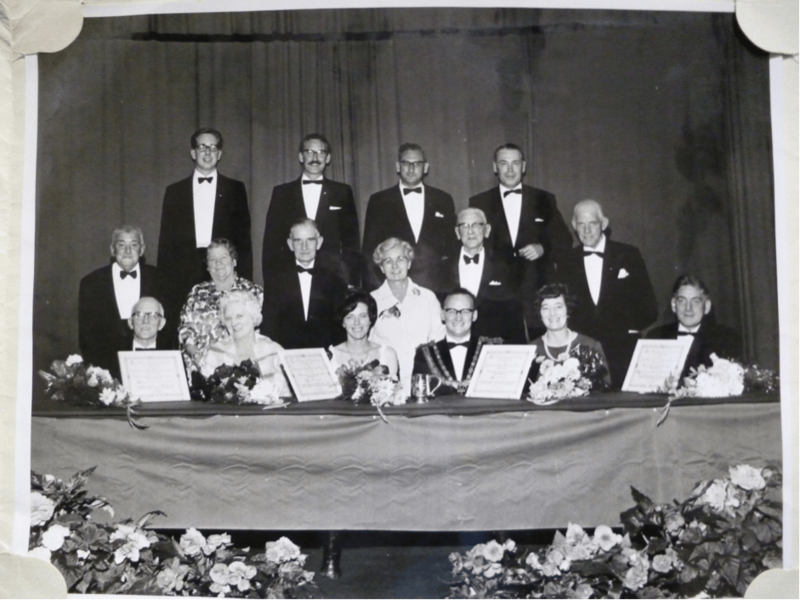 Brownhills Memorial Hall Committee in 1966 – note the familiar names. Middle row, from the left are Mr D Fullelove, Mr E Ptitchard, Mr H Lord, Mr G Bradbury. In the front row, from the left , are Mr N Waine, Mr T Ash, Mr F Poxon. Image from the Fullelove collection. The theatre came to the street one year in the form of the ‘blood tub’, a travelling theatre group in a large marquee on the ‘Top club’ field. Mariah Martin in the Red Barn was the play. Sadly it ended its tour there. On the onset of WWII’s arrival the show went off the road and was left to rot. I believe the family retired to Chase Terrace. Club life was important to the miners and a parade ritual would take place over the weekend. First port of call was the Top Club at Brewes corner, then Sankeys for heavy drinking then Breezes and finally Ogley club. The reason for this trip was, if you were a member, you had a number, each weekend you purchased your number a type of modern lotto, obviously it was placed into a draw contest. If your number came out you won the prize money. Hence the white shirted Bryl cream haired men held their ritual journey each weekend to get their numbers, possibly calling at the Railway Tavern for a quick one. Brownhills had its fair share of pubs and clubs to quote a few, The Hussey Arms, The Mutton, The Station Hotel, Warreners Arms, The Pier Inn, The Jolly Collier, The Rising Sun, The Crown, The White Horse, The Pear Tree, The Wilkin and Doody’s. Club Committees were full of the local worthy folk and it was a status to be coveted. Image from the Fullelove collection. Club life was part of family life. Eagerly awaited was the yearly event of the club trip. Each club would provide a trip to the seaside for the old members and members children. Local coach firms would be hired and coaches stocked up with pop, crisps and of course, the odd bottle for the committee. Dunn and Hale, Hopleys, Harper and Saunders of Chasetown would all line up and off they would go for the day. Each club had it’s own special choice, Rhyl, Blackpool, Weston-super-Mare. A happy silence would reign tor the day. This would be the onh time some would see the sea, I was lucky my yearly visit was a week at Winny Berwicks. somewhere in a street behind Blackpool tower. Parting words were “Bye luv, see yer next year.” My treasured memory was of Pablo’s ice-cream parlour. I was fortunate m many ways as Mom and Dad were members of Uncle George’s choir. He was a wonderful chorister and conductor He entered the choirs into many musical festivals, hence I was taken on many, many trips. One such trip I will never forget. Coach companies were big business in those days, with reputations for comfort and style. Image from ‘Memories of Brownhills Past’ by Clarice Mayo and Geof Harrington. We set off by Holymans coach for Winster in Derbyshire. On the way there the coach broke down and stopped with a mighty surge, everyone was severely shaken. In fact a baritone, one Charley Yardley could not carry on, he was too ill. Not to be outdone, alternative transport was found, the men in Mr Holyman’s coal lorry that had seats placed on the back, with women and young Reg on an old bus. Things were so desperate, to use a choral phrase, they stopped and had a run through the choral piece in a field. Finally, tired and bedraggled, we arrived at Winster, only to find the festival was in a village school hall at the bottom of a very steep hill which was not suitable for our coal lorry and bus to drive down. So, fed up, fired and uninspired, the choir walked. They were late, so as they arrived they sang, and yes, believe it or not, they won medals and the Winner’s trophy! Another memory also stands in my mind. At the end of the day the choir went for fish and chips and it was brought to light, that someone lay very ill in one of the village cottages and loved music. The result was that the choir went and stood outside the cottage, its windows were opened and the choir sang their piece in the street. The memorial hall played an active part in the earlier years of my life. This public building was controlled by trustees, made up of public figures, i.e. Teachers, business men and other responsible elders. My Father was the secretary, Bert Lord the treasurer and Mr Biggins the care-taker. Together they cared for, and looked after the building’s welfare, and yes, the magistrates court was held there. Many ten bob fines were imposed for a chink of light showing in war time blackout days. The leisure hours were catered for too, there was a tennis court, library and a wonderful maple dance floor meticulously cared for by Mr Biggins, his secret weapon to keep the floor perfect for dancing was candle fat. He would lightly shred a candle over its surface so that dancers could promenade over its surface. An original architect’s impression of Brownhills Memorial Hall, from the Fullelove collection. The billiard table of Burrows and Watts and Padmore was ironed to perfection so that what appeared to me to be the senior citizens of the town with their own personal cues could compete. I was introduced to the dancing world of Miss Gripton, a portly lady but so delightful on her feet. She ran the Friday night children’s dance, a Mecca for proud moms and youngsters, me being one of them in my little short trousers and blouse. A Fancy Dress Ball, the yearly big event. In those days various companies would supply material for these events and other activities as a form of advertising, no tele’ then, cigarette companies would provide playing cards for whist drives, Blue Bird Toffee company bunting for carnivals. I remember garden of 113 being adorned with Blue Birds one year, however, let’s get back to my dance class days. Dad had contacted the Bisto gravy people and to this day the memories of me and a little girl, whose name I have forgotten, being paraded as the Bisto kids round that dance floor. On the bright side I have lovely memories of a little Betty Everall dressed as a Dutch girl in clogs singing “Do you like my new shoes, don’t you think I look good?” Dancing was a community time with dancers of several different styles, not like today’s, standing in one spot wiggling hips and bottoms. Everybody was on the floor for the Grand march, dancers to form your sets for the visiting figures, Grand chain, Veleta, Barn dance, Gay Gordon, Palie Glide, Military Two Step, Bernard Waltz, Tango and Polka. Then came Jiving, Cha cha char and Rock and Roll. Happy days with no drugs available. Reg Fullelove gives great talks, too, like this one in 2001.
another fascinating page from Reg’s memoirs….Holyman’s coach, indeed. A little Bedford 24 seater(?) like the one facing the camerman in the image was the one that took me to my seaside holidays in Saundersfoot in the early 1950s, to one of Mr Holyman’s caravans at Scar Farm. cheers to Reg and to your goodself for the memories and excellent article. Hi Reg, You have a great ability to recall things that most people would have long forgot, keep up the good work, sorry I haven’t been touch lately. Best wishes Derek from Blackpool.